The Ohiki is a true bantam as it has no larger counterpart. It originates from Japan, where it was developed as an ornamental breed. 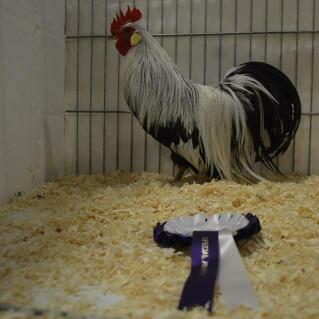 It is classed as a long tail bantam. It is best known for it's very short, olive/willow green legs and incredibly long tail feathers. It also has very long saddle feathers which hang down the body and a single comb with white earlobes. Ohiki are incredibly easy to handle, being very calm and placid. A small flock running across a garden is a joy to behold. 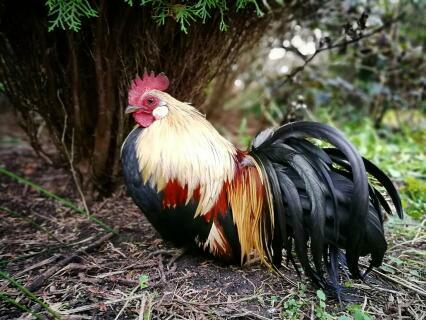 They are comical little bantams and due to their short legs, tend not to do too much damage to a lawn. They are friendly towards humans and each other and cope well with confinement, however free ranging is a must to enjoy these little bantams. They aren't the most active of breeds, so care should be taken to prevent extra weight piling on. Hens make wonderful mothers and go broody quite easily. They are very dedicated to their hatch and very protective for the first few weeks. Hens don't lay well, but will lay around 60 light brown eggs per year. Chicks are small and susceptible to illness if not kept warm for the first couple of weeks, so timing for breeding should be planned in advance to avoid the cooler months. Once fully grown, the breed is quite cold hardy. Due to their feathering, a fully covered run is advisable during the Autumn/Winter months to prevent tail feathers becoming matted. The tail feathers of males especially can reach up to 100cm long! A higher perch is best to allow the tail to hang properly. Red/White hackled, Black, Red, Duckwing, Silver Duckwing and in the U.S - Gingers. I have these in red/black, silver and also white. Just love them.